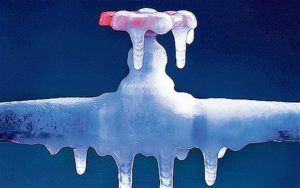 As cold weather approaches if you own a home in the Charlottesville area you probably already know that when temperatures dip into the 20’s for more than a few days the possibility of frozen pipes becomes a reality. New homeowners may have heard that winterization is important, but in the hubbub of your first year living in a home you own (finally! ), it can be easy to overlook the need to prepare for the cold weather ahead. After all, it’s just not something renters deal with; prepping pipes for winter is often the landlord’s job. During cold weather, open any cabinet doors covering plumbing in the kitchen and bathroom, especially if the cabinet is against an outside wall. This allows the home’s warm air to better circulate, which can help prevent the exposed piping from freezing. While this won’t help much with pipes hidden in walls, ceilings, or under the home, it can keep water moving and limit the dangerous effects of freezing weather. 6. Disconnect your outside hose bibs. Those can cause the faucet to burst and you won’t realize it till next spring when you go to turn on the hose to water your newly plant flowers. We live in a neighborhood where we have apartments above our detached garages. They are called Carriage homes. But, they are notorious for having the pipes freeze. The pipes come up through the unheated garages into the apartments and every winter someone has their pipes freeze in their Carriage house. Ours comes up through a chase in the garage that does have a trap door. Whenever the temperatures are in the 20’s for several days at a time we have a small space heater that we run at night to keep those pipes warm. During the day the sunlight warms things up and the heater is not needed. I hear people think because they are home and their home is heated their pipes won’t freeze. But, it happens all the time. So take care and be prepared. It’s supposed to get really cold by next weekend.